Bilsteinas competition monotube racing shock absorbers worldwide racing dominance is legendary. Pit Stop USA is The Online High Performance Superstore! We feature Bilstein 4600 Series Shocks and Struts at low everyday prices. Pit Stop USA is The Online High Performance Superstore! We feature Bilstein 5100 Series Shocks at low everyday prices. Pit Stop USA is The Online High Performance Superstore! We feature Bilstein 7100 Series Shocks at low everyday prices. Pit Stop USA is The Online High Performance Superstore! 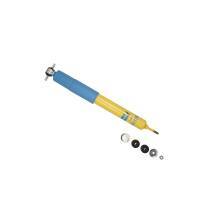 We feature Bilstein B4 Shocks and Struts at low everyday prices. Keep your Bilstein racing shocks performing their best with genuine Bilstein shock replacement and service parts. Check out the Recently Listed Coil-Over Conversion Kits. Pit Stop USA is The Online Motorsports Superstore! Be in the high banks of NASCAR racing or the harsh terrain of the BAJA 1000, Bilstein Shocks worldwide racing dominance is legendary. Racing is the ultimate proving ground, making Bilstein racing shocks success in motorsports imperative. Bilstein Shocks meet this challenge. Bilstein pioneered the monotube gas pressure shock absorber. Most short track racers still run on the older style, twin-tube shocks. But if you watch closely, youall find more of your competitors switching to the up-to-date, Bilstein monotube gas pressure shock absorbers. Although there are other brands of monotube gas shocks making an appearance in Americaas pit areas, Bilstein technology is so far ahead and so different, that their performance cannot be equaled. Bilstein racing shock absorbers larger piston area produces instantaneous response to the slightest suspension movements. Dead spots in a Bilstein are an impossibility. This is the reason that all NASCAR, Indy Car, Formula One and Off-Road racers long ago discarded twin-tube shocks in favor of Bilstein monotube gas pressure technology! Bilstein offers a full line of competition shock absorbers and components. Bilstein AK Series Shocks are designed for Pure stock, Enduro, Street Stock (stock mount), steel body stock mount, Mini-Stock shocks and struts. Bilstein SG Series Shocks are designed for Stock Cars, IMCA / UMP Modifieds, Midgets, Mini-Sprints, Modified Lites and Dwarf Cars. Bilstein SZ Series Shocks and Bilstein SL Series Shocks are designed for Modifieds and Late Models. Bilstein SN Series Shocks are perfect for Modifieds, Late Models and Sprint Cars. Bilstein ASB Series Shocks are used on Sprint Cars, Midgets, Ultra Mini Sprints, TQ Midgets, Micro-Midgets and Formula Cars. Bilstein ASN Series Shocks are for Modifieds, Late Models and Sprint Cars. We feature Bilstein Racing Shocks, Bilstein Coil-Over Kits and Bilstein Shock Replacement Parts at low everyday prices!